I swear this household is filled with Troublemakers. Myself included, of course. Today it was the turn of the eldest to have a day off school. She’s well acquainted with my mouse phobia issues and the cringing involved in the crafting of this one’s tail. So why would I be surprised when a strategically hidden mouse keeps reappearing to punctuate my day? I punctuated the day of every other living being within a 5km radius with my first honest-to-goodness shriek (there were shadows, there was a sticky-out tail, I wasn’t expecting evilness). Admittedly the following shrieks were for entertainment value alone but nonetheless impressive. In the end, I figured if you can’t beat ’em, join ’em. 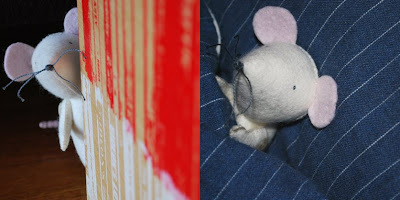 It was fun posing mouse around the house. Naturally, the state of the place is still as vile as it was this morning (I only cleaned the bits where we were photographing) and it was eggs on toast for dinner tonight, but the kidlet and I had a grand giggle. Jodie of Ric Rac fame is responsible for the fab Jofus and Lally pattern. My take is a lazy handsewn version (not sure why pulling out a sewing machine lately seems a chore as major as negotiating a large mountain), but you can find the way it’s supposed to be done right here. That's a cracker for sure! 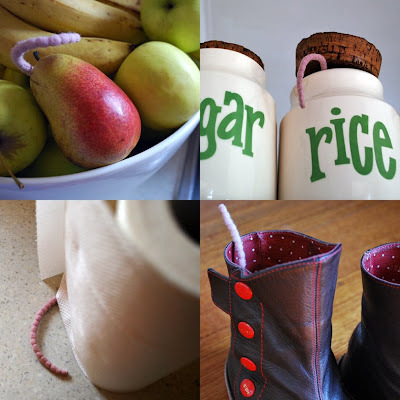 I think my favourite photo has to be the tail poking out of the rice jar. My sisters and I never remember having days off school because we were sick. Mum always made us go and would "pick us up at recess" if we were still not well. But.... she did let us have a day off ever now and then to spend with her. We remember these days and loved them. I'm sure your girl will too. Your mouse is gorgeous and given his cheeky behaviour, should fit in at your house quiet well! You guys are creating wonderful memories! I love this little mouse! 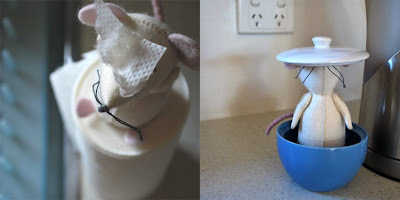 Well done for overcoming mouse phobia (well, cloth-mouse phobia at least). I am especially proud of you for taking it up with that mouse! Great pics!! Oh, dear little mouse! Although the shot of him in the rice jar gave me the heeby jeebies just a tiny bit. And that aubergine hat looks finished to me! Weave in that end and plonk it on a baby head right now! gorgeous post... with creative brilliance in your photography.. so cute and what fun! great post and pics, looks like a great day was had - hopefully not so great that the illness continues! So so sweet. This mouse has a personality all its own. These photos are brilliant. Hilarious! naughty little mouse! my heart melted at the sight of the wee mouse, i have a thing for small furry animals and you have done a fab job with him. Ha Ha... Thanks for brightening up my day Tania! I love the mouse shots, especially the one of him peeking around the side of the books. The tail is particularly disturbing at the bottom of the paper towel...eek! I can imagine all the giggles what a great idea to giggle around this little mouse adventures with your little one! ;)However, the tail coming out of the boots still gives me shivers;)!! Oh my, that is so cute, I love the one where he's falling into the side of the couch, so funny!!! In a week when it all almost came undone - you have made me smile smile smile... I love the handsewn look ...and that tail is freakily real. Fantastic post! Love your clever photography and imaginative styling - looks like you had lots of fun. this is gorgeous, love the photos sooo much and your little mouse is adorable. I too can relate to the machine being a chore at times. I'm guessing you wouldn't like my photos of our pet rats then????!!!!! Just come over from Jodie's and all I need to say is cute cute CUTE! Oh, and very funny too! our cat Saar would love to come and play with you! So gorgeous! Cheeky mouse in the house! Looks like scenes from The Tale of Two Bad Mice. You gave me such a laugh - I love your photos. I am in love with your whimsy! The cutest mouse ever and very fun! That's awesome! You've done such a great job!! 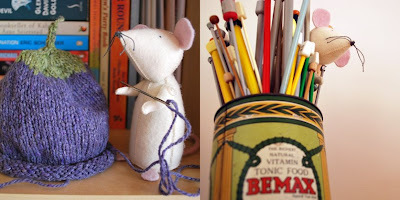 Lovely mouse - and great photos! Very silly...and sweet! Loved this story! 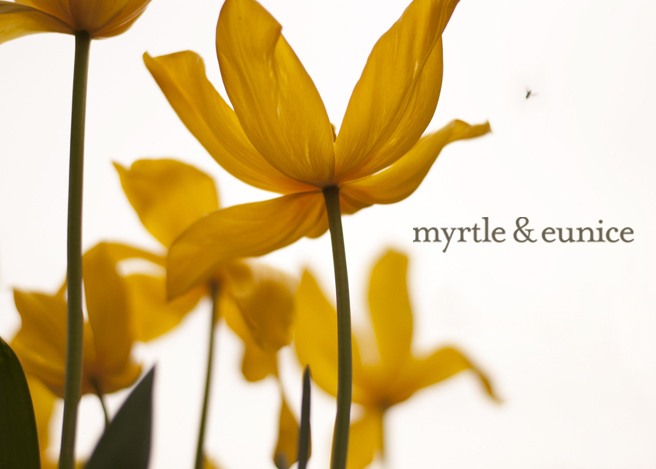 Gorgeous post and what cute photos! Hope your mouse-o-phobia is a little bit better for it! hehehe what a cute mousey! I love your hand-sewn mouse! Such a character - so glad you had such a fun day!! What fun! Jodie sent me here, promising me a smile if I did, and boy, was she right. 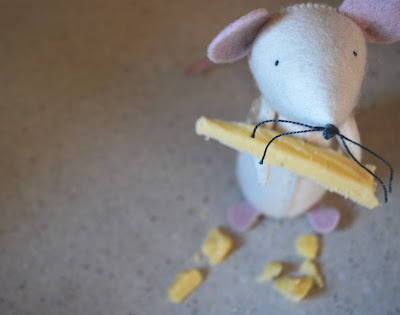 Love your mousie and the clever photos. looks like lots of fun was had, and only a little bit of screaming. Love the photos.